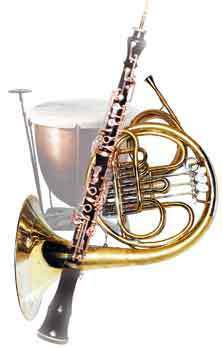 The most significant differences to the worldwide-used instruments can be found at the horns (Vienna Horn), oboes (Vienna Oboe) and timpanies (Vienna Timpany). Their particular acoustical properties and their consequences on the playing technique contribute significantly to the sound of the Viennese Orchestras. The "Viennese Clarinet" is a slightly modified German model (Oehler System). The main difference concerns the mouthpiece: whilst the gap between the tip of the reed and the mouthpiece of the German model is 1 mm, the Viennese instrument provides only 0.7 mm. Consequently a more "heavy" reed has to be used which causes in general a darker sound. Concerning the bassoons, Viennese Orchestras use the German model. Differences to Germany can be found only in the playing technique: Viennese bassoon players prefer so called "long" notes. In Vienna the German Trumpet with Rotary Valves is used.